Donald Judd came to critical acclaim in the 1960s with his simple, yet revolutionary, three-dimensional floor and wall objects made from new industrial materials, such as anodized aluminum, plywood and Plexiglas, which had no precedent in the visual arts. His oeuvre is characterized by the central constitutive elements of color, material and space. 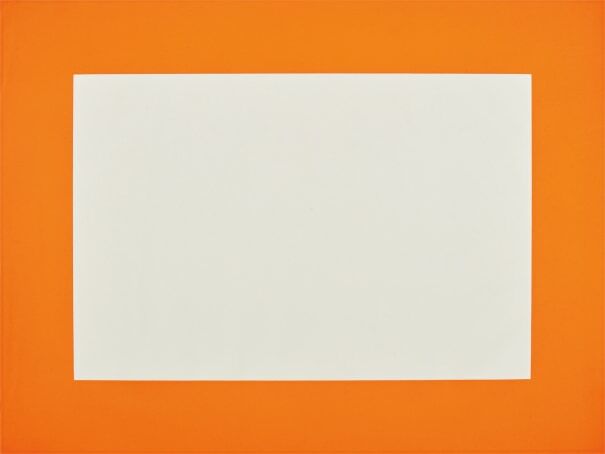 Rejecting the illusionism of painting and seeking an aesthetic freed from metaphorical associations, Judd sought to explore the relationship between art object, viewer and surrounding space with his so-called "specific objects." From the outset of his three-decade-long career, Judd delegated the fabrication to specialized technicians. Though associated with the minimalist movement, Judd did not wish to confine his practice to this categorization. Inspired by architecture, the artist also designed and produced his own furniture, predominantly in wood, and eventually hired a diverse team of carpenters late in his career. Woodcut in colors, on Tosa Honga Japanese laid paper, the full sheet. Signed and numbered IX/XV in pencil on the reverse (there were also 10 artist's proofs), published by Kölnischer Kunstverein, Cologne (there was also an edition of 25 in Arabic numerals published by Brooke Alexander Editions, New York), framed.